"With the 1969 release of 6-And 12 String Guitar, Leo Kottke established his pre-eminence as a guitar virtuoso and composer of quirky, pop-inflected pieces. Harmonically adventurous and technically dazzling, this album showcases Kottke`s penchant for infusing traditional elements of folk guitar with more modern, even impressionistic harmony and tonality. 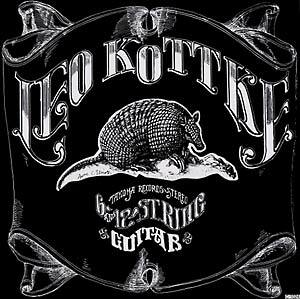 Kottke inspired a revolution in acoustic guitar playing, and this record provided the opening volley. 'The Driving of the Year Nail' starts things off with a relentless fingerpicked chug, featuring splashes of open harmonics executed with the delicacy of a ballerina. Kottke proceeds to combine the familiar with the strange -- each of these brief pieces (around three minutes and under) has the effect of being simultaneously charming, and a little twisted. For example, 'Vaseline Machine Gun' starts with 'Taps' played with a bottleneck slide, then morphs into a thumb-and-slide frenzy. Bach`s 'Jesu, Joy of Man`s Desiring' is the exception, given a straight and loving reading on six-string guitar. This is pure steel-string joy, with liberal doses of irony and ecstasy."